In nature, carbon uses energy from the sun to cycle from the atmosphere to the forest and back again. Here’s how it works: trees absorb carbon dioxide from the air as they grow. In fact, about half their dry weight is absorbed carbon. When old trees die and decay, or are consumed in a forest fire, all that carbon is re-released into the air as carbon dioxide. This is nature’s carbon cycle. 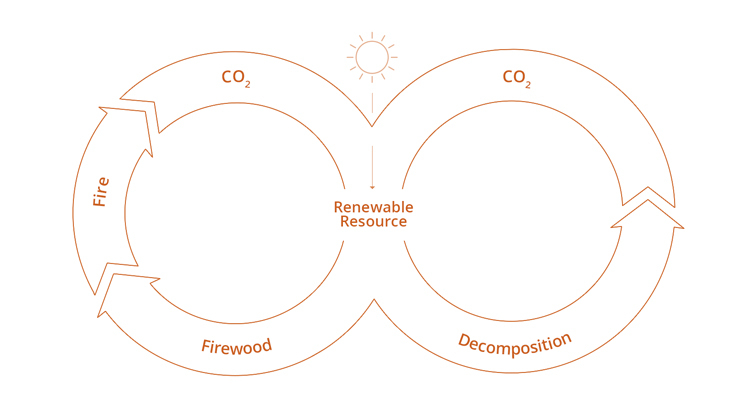 Heating with firewood means heating your home using the natural carbon cycle. The fire releases the solar energy stored by the wood as carbon. Other fuel options —such as oil, gas, and coal— are all known as fossil fuels because they come from deep within the earth. When they are burned, it is this old unburied carbon that gets released into the atmosphere thereby increasing the total level of carbon dioxide. Whereas burning wood simply releases the same carbon dioxide the trees used to grow, burning fossil fuels adds carbon dioxide to the atmosphere, a result which has been linked to global warming, climate change, and the unusual weather we’ve seen in recent years. Not only can a clean-burning RSF fireplace heat your home more efficiently, it also allows you to heat your home with a lower environmental impact than any other fuel option. A wood-burning RSF fireplace leverages the natural carbon cycle to heat your home and using wood means burning less fossil fuel, emitting less greenhouse gas, and promoting a healthier environment.